Once upon a time I was a yo-yo master. I was one half of the yo-yo performing duo known as The King’s Yomen. I slung a yo-yo on the corner of Michigan and Pearson in Chicago, a bonafide street performer. I’ve even reflected on how the yo-yo became my salvation from a soul-sucking chapter in high school. Heck, my company even celebrated its five-year anniversary with a yo-yo. That’s all once upon a time. I still have lots of yo-yo’s. There’s even one sitting on my desk. But I don’t throw a yo-yo on a daily (or hourly) basis like I used to. But my friend Adam does. He’s the one who taught me how to yo-yo and dragged me on stage as the other half of The King’s Yomen. A couple years ago I saw his face in Walgreens, plastered on a yo-yo and still spinning strong. He’s still at it today, cranking out how to yo-yo videos at YoTricks.com. This week Adam launched a Kickstarter campaign to create his own yo-yo. Not just some wood yo-yo with his name on it (been there, done that), but a $90 aluminum yo-yo with ball bearings, perfectly balanced and designed for advanced players to do 1A string tricks. 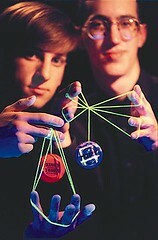 That’s right, you’ve just had a glimpse into the intricate world of yo-yo geekery. I knew it existed it, I was neck deep in it once upon a time. We had $90 aluminum ball bearing yo-yo’s in my day (Look: Here’s my 15-year-old self playing with one), but they weren’t that good. And we didn’t produce them ourselves. Now before you dismiss this as being too geeky and not worth your attention: Adam’s Kickstarter campaign has raised $4,700 and counting in less than three days. The geeks shall inherit the earth. Adam has another 30 days to raise funds, so it’ll be fun to see where this goes. You can get his fancy new yo-yo for $75, but if that’s not quite your speed you can get a beginner yo-yo for $15 (and learn how to use it at YoTricks.com). I love Kickstarter. Now I just have to decide how badly I need a $90 yo-yo.